Modern technology and observable science in the west have shattered many of the superstitions related to gemstones. In our day, the rise or fall in market value has more to do with rarity, means of acquisition, and intrinsic value than whether it will bring good or ill fortune to its wearer. While provenance continues to play a significant role in the value of a jewel, the stories and beliefs that followed that jewel through history are largely dismissed as silly superstitions or embellished legends. It is difficult for the western mind to enter into the rich depths of a gemstone's legacy. To abandon our rational mind and step into the shoes of someone who really didn't "know" better is difficult at best, impossible at worst. To our way of thinking, our forefathers reasoned more like wonder- or fear-filled children, attaching innumerable associations to events, reaching the absurd conclusion that the presence or absence of a gemstone might have influenced a buffalo hunt, the birth of a state, or the Black Plague. Yet, despite 'knowing better,' we are often haunted by the legends of the ancients. We are intrigued by the possibility that perhaps in our rational world we might be missing something that our ancestors understood. Of course, we can't go back, nor would we want to. Ignorance, contrary to the popular cliche, really is not bliss. Whatever ills and trials forward progress creates, few of us would trade the calamities of our western world for the savage lessons our ancient forebears learned on our behalf. But what if we could go back, just in our imaginations, and really feel what they felt, understand things the way they understood them, and see the world through their eyes--even for a few moments? What if, by placing ourselves in their shoes just for a few minutes, we could bring some of their wonder back into our century? What if we could enjoy just a touch of the magic they must have felt when they first laid eyes on a brilliant diamond or a flashing opal? In order to help us enter in, I'm collecting some of the best stories associated with gemstones. I'll be building this slowly over time. If you come across a moving story about the earth's treasures, I invite you to leave a comment. Your suggestion might just find its way to the Jewels of Note Gemstone Legends page. 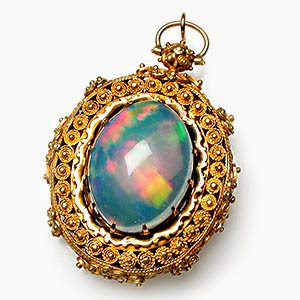 ©2012 Jewelry-History.com. Articles are originals. No reposting. Cite and link to any excerpts used. Simple theme. Powered by Blogger.